Paris is my favorite city to travel to, and I often get asked by friends where they should stay when visiting the capital of France. I usually visit two to three times per year, so I’ve had the chance to experience many different hotels across the city. My favorite approach these days is to spend half of the time on the right bank and the other half on the left bank. This gives you a great opportunity to see Paris from many different vantage points, and to also explore some neighborhoods and special areas that are not overrun by tourists. 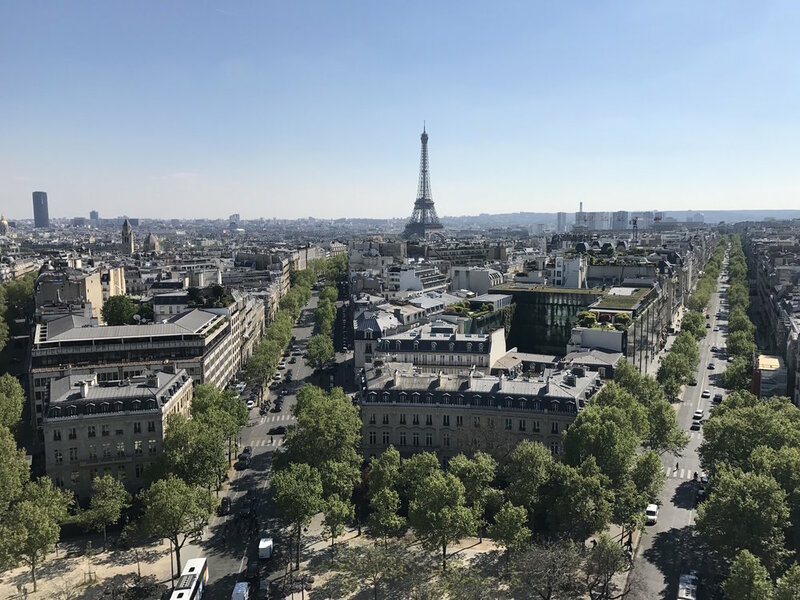 I have talked about some of my favorite hotels in the past across sporadic posts, but I am consolidating my favorite hotels here to make it easy for you to find the perfect home while visiting the city of lights! This is my absolute favorite hotel in Paris, and it just might be my favorite hotel in the world. A few years back my friend Julie introduced me to this charming hotel, and I have now made it my home away from home when in Paris. It's a small luxury boutique hotel that has all of the romantic elements of France: a magical courtyard, unique décor in each room, and a beautifully redesigned lobby that marries old world charm with newer and modern elements. All of the rooms are wonderful, but if you have the chance, I recommend splurging for one of the duplex rooms which has two floors. The lobby was recently redone and offers an Honor Bar, as well as a comfortable and regal lounging spot. The staff will go above and beyond to ensure you have a perfectly Parisian stay. The Relais Christine has it all. I read about Le Roch Hotel & Spa in Condé Nast Traveler when it made The Hot List 2017: The Best New Hotels in the World. It sounded like a place I wanted to explore, so my friend Erica and I decided to stay there for three nights in April of 2017. Le Roch is modern and has a gorgeous aesthetic with a color palate of turquoise, mustard, and gold. The lobby has a beautiful sitting area, a nice restaurant and a small bar, and there is also a cute outdoor patio around the back. Our room was new and offered comfortable amenities including an iPad for exploring all of the hotel offerings. I would stay here again in a heartbeat. It was fabulous, and also was a perfect launching pad for those looking to be within walking distance to some of the main attractions in Paris such as The Louvre, the Tuileries Garden and Place Vendôme. If you’re looking for a hip, lively, and Instagram-worthy hotel, then The Hoxton is the spot for you. Part of a small chain of hotels with locations in Amsterdam and London, The Hoxton is located in the old garment district of Paris along Rue du Sentier. The lobby features an indoor-outdoor courtyard with stone floors, greenery and vines all around, and a coffeeshop serving up delectable pastries. The hotel also includes a restaurant called Rivié and tons of comfortable seating in the common areas for lounging with friends, doing work, or just admiring the trendy patrons. I stayed here on a solo trip this past February and it was a wonderful home base for exploring the right bank, and within walking distance to some of Paris’ most well known restaurants including Frenchie. The Hoxton is a great choice for a girls trip, a solo trip, or for people who want to stay in a modern environment and explore some of the more up and coming neighborhoods in town. Years ago my friend and I splurged and stayed at the Park Hyatt in Place Vendôme. It was ritzy and stunning, but it was incredibly expensive and I don’t think you need to pay those prices in order to have an amazing stay in Paris. It also lacks the quaint nature and charm of some of the smaller boutique hotels. I have also stayed at The Westin Vendôme, Hôtel du Louvre (before it was bought by Hyatt), and the Renaissance Paris Arc de Triomphe. All were very nice, clean, and comfortable, but I wouldn’t consider any of them special. In addition, on my most recent trip I stayed at the Renaissance Paris Republique which was very nice (and new!) and in a great location between the Marais, the Oberkampf district, and Canal Saint-Martin if you’re looking for a cooler neighborhood on the right bank. I have also heard wonderful things about the following hotels, but have yet to stay at them so cannot vouch for them personally: Hotel d’Aubusson, Grand Hotel du Palais Royal, and Hôtel de Crillon. And for a more affordable option, I’ve gotten recommendations from people I trust for Hôtel Fabric in the Oberkampf district.